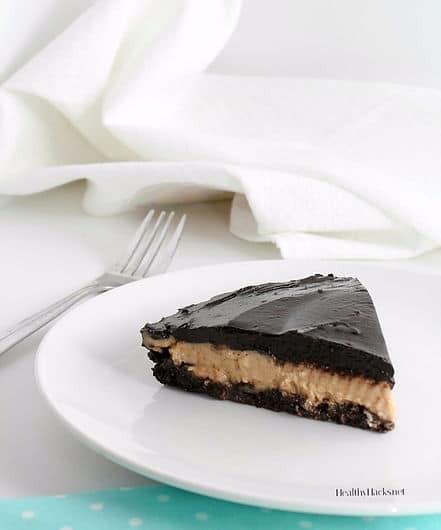 When will a dietitian recommend eating a chocolate peanut butter pie? When it’s made with wholesome, healthy ingredients and full of nutritional benefits! This pie is creamy, flavorful, and melts right in your mouth. 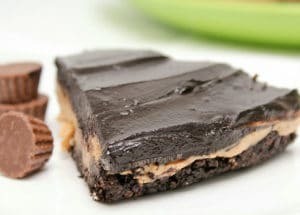 because it features a thick layer of creamy, moussey, peanut butter that is sandwiched between two layers of chocolate. One layer being a nutty crust and the other being a smooth, ganache-like frosting. And because I’m sure you stuck around (because who doesn’t like chocolate and peanut butter!?) don’t worry, this chocolate peanut butter pie is not as difficult to make as it sounds. It really only takes a few minutes of hands on work before you pop it in the freezer and that takes care of the rest! For something so decadent, rich, and delicious, it’s almost hard to believe it’s full of nutrient-dense, healthy, wholesome ingredients. Your taste buds are sure to be fooled with this one. It starts off with a chocolate-y, nut based crust that is full of healthy fats. I used pecans and almonds because I found that it gives a good base of flavor without overpowering the peanut butter or chocolate, but you can pick and choose whichever nuts you like based on your own tastes. 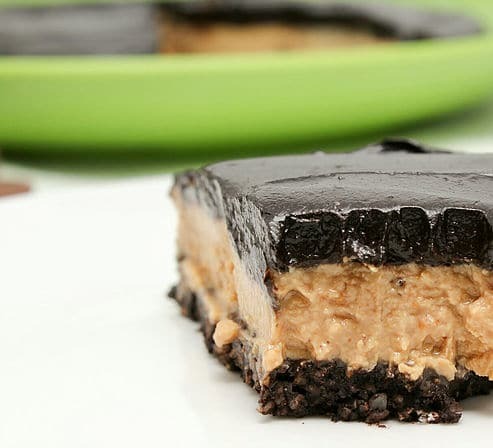 The next layer is the dreamy, creamy peanut butter filling. While most pies with a filling this rich and thick are loaded down with unhealthy fats and sugar, this filling is far from that! It is made with silken tofu, which adds a good punch of protein while also contributing to the amazing texture. Don’t worry, it in no way, shape, or form tastes like tofu. And that is thanks to the powdered peanut butter. 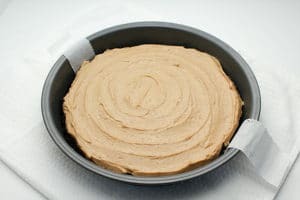 Powdered peanut butter is great because it significantly cuts down on the calories when compared to regular peanut butter, so you can actually eat a nice big slice of this pie without overdoing it. But, you still get that peanut buttery taste. WIN-WIN! To top it all off, you get a rich chocolate icing that I can only describe as decadent. It tastes just like that smooth ganache stuff that you find on fancy chocolate cakes. But, this icing has a healthy twist in that it is made with avocados! The texture of avocados gives the perfect consistency to this icing. It took quite a few tries to get this icing just right, so don’t worry, it doesn’t taste like guacamole (not going to lie…the first batch kind of did…). This is just chocolatey perfection with nutritious health benefits. 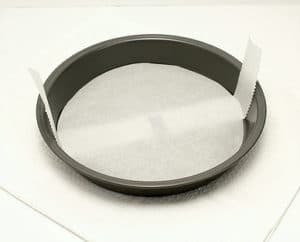 And if you were wondering what was sticking out of the sides of my pan, here’s a tip: if you’re like me and don’t have a springform pan, you can place a strip of parchment paper at the bottom of your cake pan to make handles so you can lift your pie out when it’s all done. It’s a good thing this recipe makes a whole 9” pie, as you’re going to want more than a tiny slice. And bonus, this pie is made to be kept in the freezer, so in the off chance you do have leftovers they can easily be kept frozen for a few months. But, trust me, it won’t last that long! Just promise me you defrost the pie for about 30 minutes at room temperature (or for 1-2 hours in the fridge) before you eat it. Eating it right out of the freezer does it no justice as it’s too crunchy and not creamy and smooth. So RUN, don’t walk, to the kitchen to make this pie right now! And you can thank me later, once your mouth is no longer full of chocolate peanut butter pie goodness. 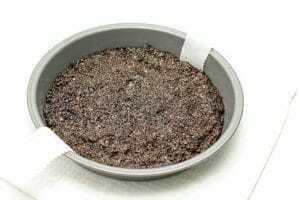 Grease or line with parchment paper a 9” springform pan or 9” round cake pan. For the crust, place the nuts in a food processor or blender and pulse until finely chopped. Be careful not to over blend them to turn them into a butter-like consistency. You want them to be more flour-like. Add in the oat flour, cocoa, milk, sweetener, agave, and salt and pulse a few more times until everything is combined. Press the crust into the bottom of the prepared pan. Place pan in the freezer to set. For the peanut butter filling, drain the water from the tofu. My recommended method for silken tofu is to place it in a colander over a bowl, cover with paper towels, and press down on the tofu to remove the excess water. In a medium bowl, add the powdered peanut butter, agave, extract, and salt. Once the tofu is drained, add that to the bowl. With an electric mixer (or whisk), whip the ingredients until all the lumps are smoothed out. Using a rubber spatula, spread the peanut butter filling onto the set crust. Place it back in the freezer to harden. For the chocolate icing, place the avocado, cocoa, milk, sweetener, vanilla, and salt in another medium sized bowl. Whip the ingredients together until completely smooth and incorporated and there are no more lumps. Once the peanut butter filling is set (and trust me, you want to be patient and let it set. 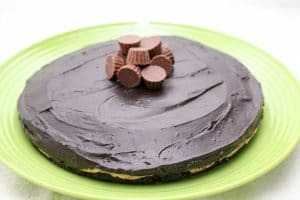 It will make spreading the chocolate much easier), spread the chocolate icing onto the peanut butter filling and place it back in the freezer for a few hours to set. Or, if you’re ready for a taste (and who would be!?) let it thaw for about 15-30 minutes on the counter and slice away!